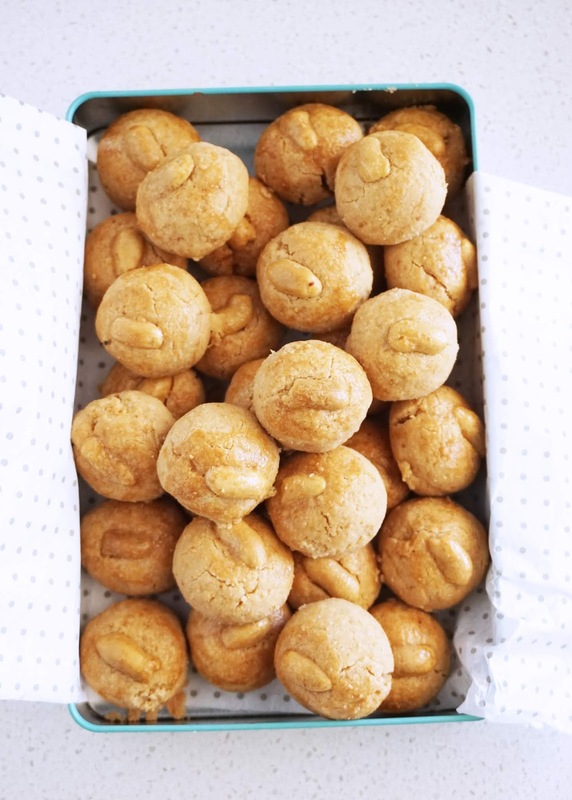 Salty and sweet peanut balls that crumble and melt into a puddle of peanut butter in your mouth. Like eating peanut butter straight from the jar, the crunchy type. Dangerously moreish and only requires 5 ingredients. I like the 5 ingredients idea. The theory is that the fewer the ingredients, the easier it is to make. It also means less food waste. And it fits in my minimalist living resolution this year. Talking about resolutions. One of my resolutions last year was to update this space more often. Well that was a fail. Like my other 10 resolutions. ¯\_(ツ)_/¯ I will try harder this year. In case you haven't noticed, I have given this blog a makeover. It's about time anyway as the old design was starting to look tired. What do you think? Do you like my new blog layout? If I'm to split this blog into 3 categories, what should it be? I'm thinking maybe based on difficulty levels - easy, challenging, and time consuming? These peanut cookies fall under the easy category as the food processor does majority of the work. Preheat oven to 170C conventional (or 150C fan-forced). Line a baking tray/sheet with baking paper. Place peanuts, plain flour, sugar and salt in food processor. Blitz until the peanuts have the same consistency as the flour (about 30 seconds). Add oil and pulse until it forms a dough. See note 2 below. 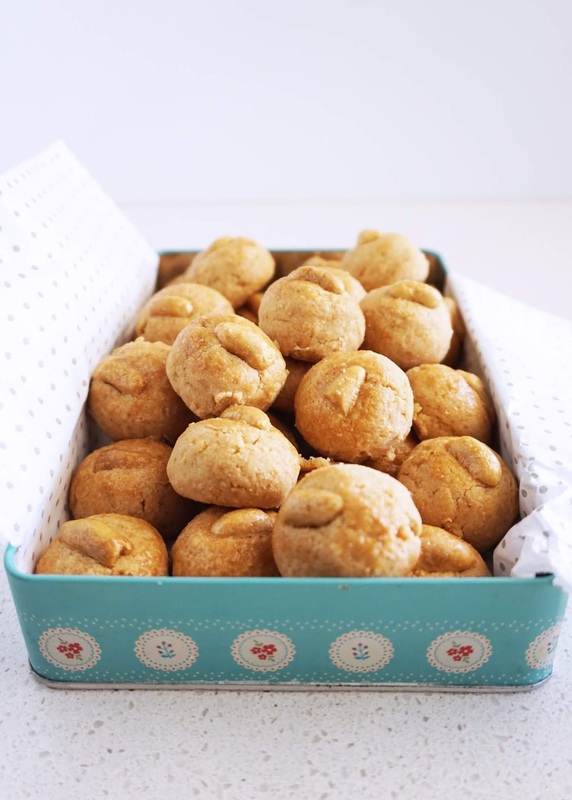 Scoop a tablespoon of dough, shape into a ball, and place onto the baking tray/sheet. Repeat until all the dough is used up. Gently press a peanut half on top of each cookie. Dip your finger into the egg, and lightly dab on each cookie. Bake for 15 minutes. Allow the cookies to cool completely on the tray. Store in airtight container. Note 1: Use raw (unsalted and unroasted) peanuts if possible as you can control the amount of salt that goes into the recipe. Salted roasted peanuts can be used in this recipe, just omit the salt in this case. Roast the raw peanuts in a preheated oven at 160C for 5-10 minutes or until golden. Note 2: If the dough is too dry and not coming together, add more oil, a tablespoon at a time. I needed about 10 tablespoons of oil in total. The dough is ready when you can shape a tablespoon of dough into a ball without it falling apart. If there is a cake for every season, I think this pear caramel chocolate cake is a strong contender for autumn. Maybe it's the golden caramel colour. It reminds me of yellow gold autumn leaves and russet brown bosc pears. I didn't use bosc pears for this cake though, but the packham which I trust for holding its shape when poached or saute. 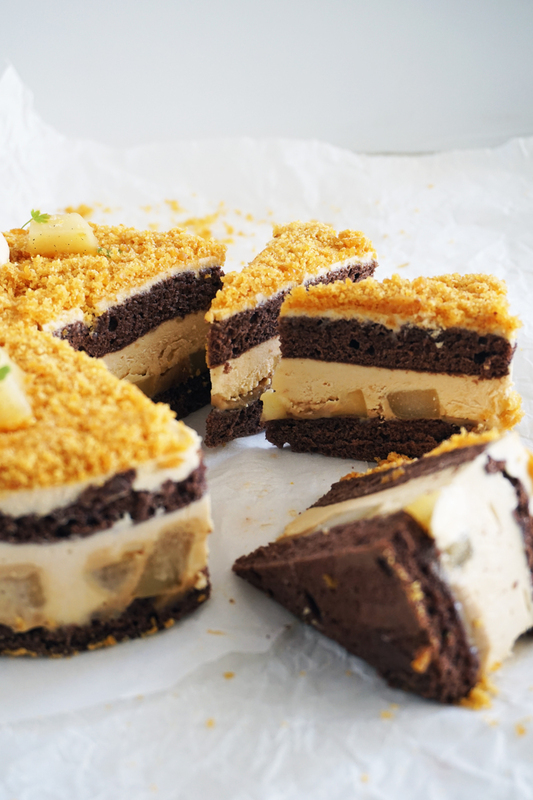 There are 6 components to this cake- chocolate sponge, vanilla syrup, caramelised pears, caramel sauce, caramel mousse and crushed caramel. The cake is fairly easy to make, especially if you work with caramel before. This is the type of cake I love to make and eat. It is light, and surprisingly with the amount of caramel in this cake, not overly sweet. 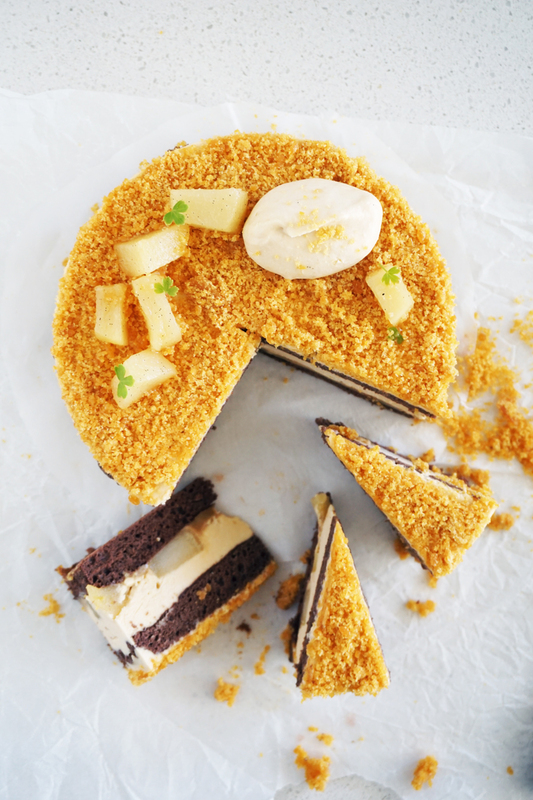 And of course, we can't go wrong with the classic flavour combination of pear, caramel and chocolate. Combine the water, sugar and vanilla extract in a small saucepan over medium heat, stirring until sugar dissolves, bring to a simmer for 1 minute. Remove from heat and set aside to allow to cool completely. Preheat oven to 160 degrees celcius fan-force. Line 2 baking trays with baking paper. Combine and sift flour and cocoa powder. Set aside. Using an electric mixer fitted with a whisk attachment, whisk the egg whites at medium speed until foamy. Gradually add sugar and whisk until stiff peaks form. Add egg yolks and whisk until combine, about 5 seconds. Remove bowl from mixer, and gently fold the flour and cocoa powder mixture into the egg mixture with a flexible spatula. Spoon the cake batter into a piping bag fitted with 1cm plain tip. Pipe half into 16cm circle on each of the prepared baking trays. Bake for 10-12 minutes, until just firm to touch. Transfer cakes to a rack to cool completely. Split the vanilla beans lengthwise in half and scrape out the seeds. Remove from heat and allow to cool completely. Remove the vanilla beam. Warm heavy cream in microwave oven for 30 seconds. This will make it easier to combine with the caramel then if it were cold. Carefully pour the cream into the caramel in three batches, stirring with a wooden spoon after each addition until smooth. Add the butter and cook over medium heat until the caramel sauce is creamy and smooth, about 10 seconds. Remove from heat. Note: make caramel mousse only when you have make all the above components and are ready to assemble the cake. Carefully stir in water. This will reduce the temperature, so slightly reheat the caramel. (Tip: you might find that the caramel will seize up when you add the water. It's fine. Keep stirring until the caramel liquefy. Don't be afraid to turn down the heat to low if required.) Remove from the heat. Soak the gelatine sheets in a bowl of cool water. Set aside while you are making the custard. Whisk egg yolks and 1 tablespoon caster sugar in a bowl until light and creamy and sugar dissolves. Bring the milk to a boil in a small saucepan. Whisk it into the egg yolks and return the custard to the saucepan. Pour in the watered-down caramel. Cook over low heat, stirring constantly with a wooden spoon, until the custard thickens slightly and coats the back of the spoon. Squeeze the gelatine sheets dry and stir it into the caramel custard with a wooden spoon until dissolves. Cover surface of caramel custard with plastic wrap. Let the mixture cool, but be careful that it does not set. If it does, reheat it very slightly. Whip the cream until it folds a firm peak. Fold one-third of the whipped cream into the cooled caramel custard to lightened it. Gently fold the caramel custard into the remaining whipped cream with a flexible spatula until smooth. Place the 15cm diameter x 5cm high cake ring on one sponge cake. Cut off the excess. Repeat with the second sponge cake. Leave one of the sponge cake in the cake ring. Brush the cake in the ring with vanilla syrup. Spread the diced pears in the ring over the cake. Reserve some of the pears for decorating if you like. Spread about half of the caramel mousse on top. Make sure to leave enough room for the second cake and another layer of mousse. Carefully place the second sponge cake on the mousse and brush it with syrup. 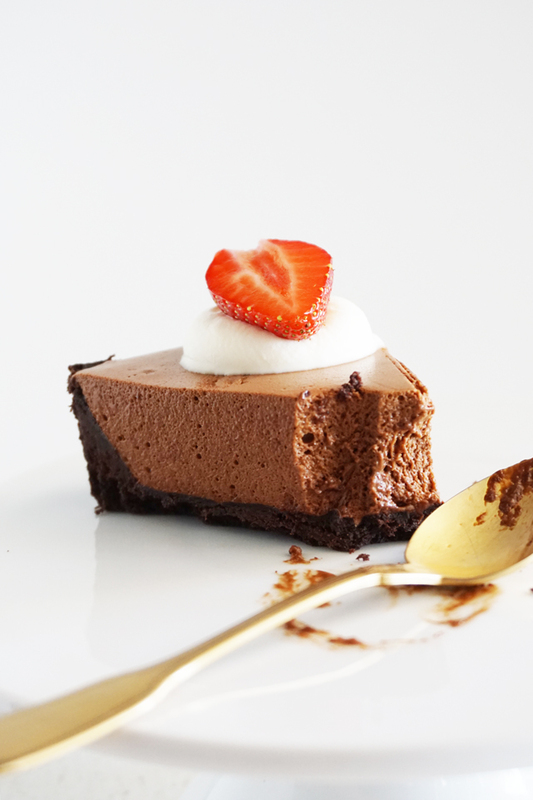 Pour over the remaining mousse over the top and smooth it with a thin spatula. Freeze until the mousse is set, at least 1 hour. Pour the caramel in a thin layer on the prepared baking sheet and spread evenly with a thin spatula. Let cool, then finely crush with a rolling pin. Remove cake from the ring. Sprinkle the crushed caramel over the top of the cake. 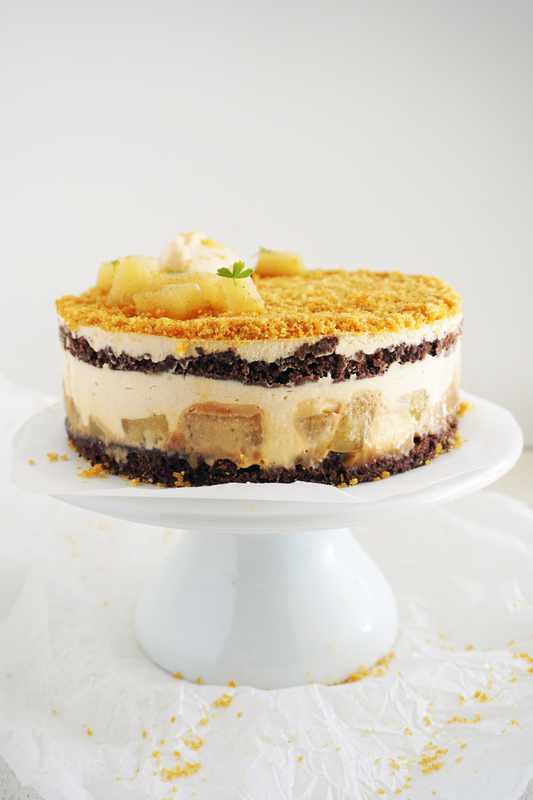 Decorate with the reserved pears and leftover caramel mousse if you like. I was contemplating if I should split this recipe into three separate posts. 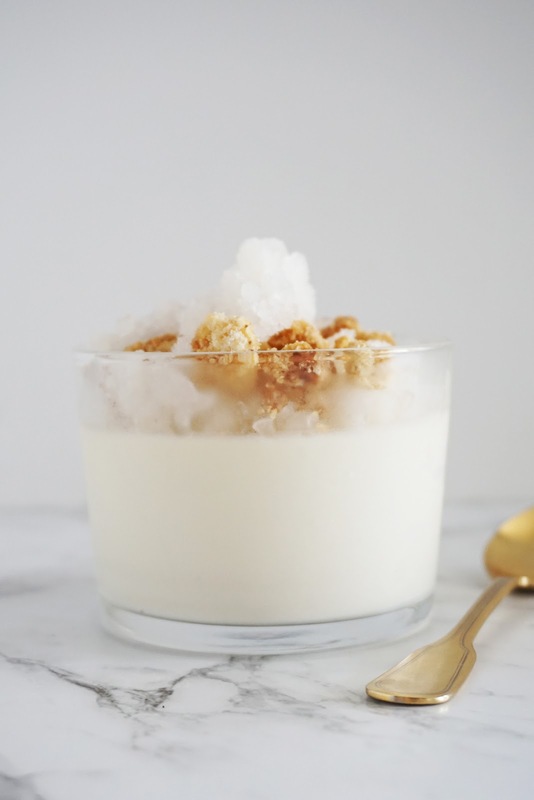 The coconut panna cotta, the lychee granita, and the coconut shortbread are originally three separate recipes, and perfect on its own. But when put together, it is magic. 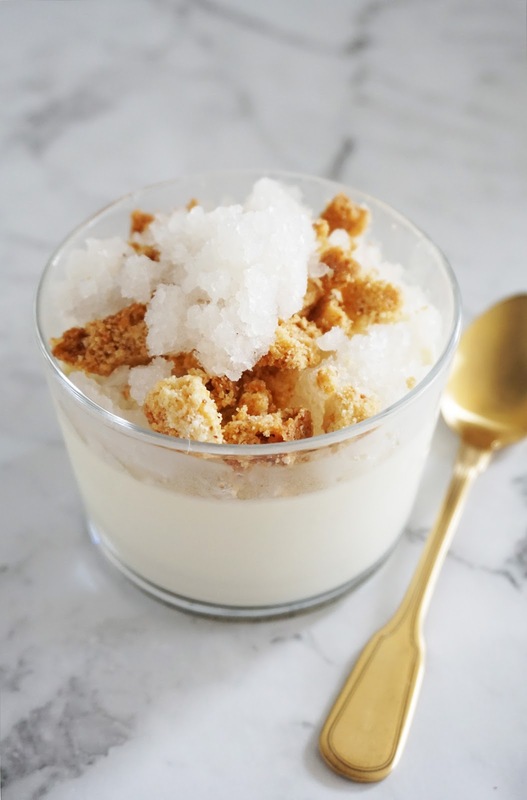 The lychee granita is refreshing and light, contrasting with the creamy and rich coconut panna cotta, and the coconut shortbread crumble adds a welcome coconutty crunch element. There are two things about this dessert that surprised me. First, lychee and coconut go well together. Who knew. Second, I love granita. I never had granita before until now. I wasn't expecting that granita will be so light and fluffy. I guess it's much like shaved ice, and I do love the Hawaiian, Taiwanese and Korean version. Granita is really easy to make, albeit a little time consuming because we need to scrap the ice every hour for 4-6 hours or until it reaches a snow-like consistency. But it requires hardly any effort. For a lighter version of the coconut panna cotta, feel free to substitute half quantity of cream with milk. Or if you really want to, all the cream with milk. You can also adjust the sugar in the panna cotta to your liking. I don’t like my desserts to be overly sweet, so 2 tablespoons are plenty for me. Give it a taste after you combine the ingredients and bring it to boil. Add more sugar at this stage if you want, stir to dissolve. This is best make a day in advance. Combine pandan leaves, coconut milk, cream, sugar, vanilla bean paste and desiccated coconut in a saucepan, and bring to just below boiling point. Taste for sweetness, and add more sugar if require. Remove from heat and set aside for 30 minutes to allow the flavour to infuse. Place gelatine sheets in a bowl of cold water and set aside for 5 minutes or until soften. Meanwhile, bring the coconut mixture back over medium heat until warm. Remove from heat. Squeeze the gelatine sheets to remove excess water and stir it into the warm coconut mixure until it has dissolves. Strain the mixture through a fine sieve into a pouring jug. Pour the mixture between 6 small serving glass. Ensure to allow enough space on top for the granita and crumble. Cover and chill in the fridge overnight to set. Using a blender, puree lychee and syrup until smooth. Strain the lychee and syrup puree through a fine sieve into a shallow dish. Cover and transfer to the freezer. 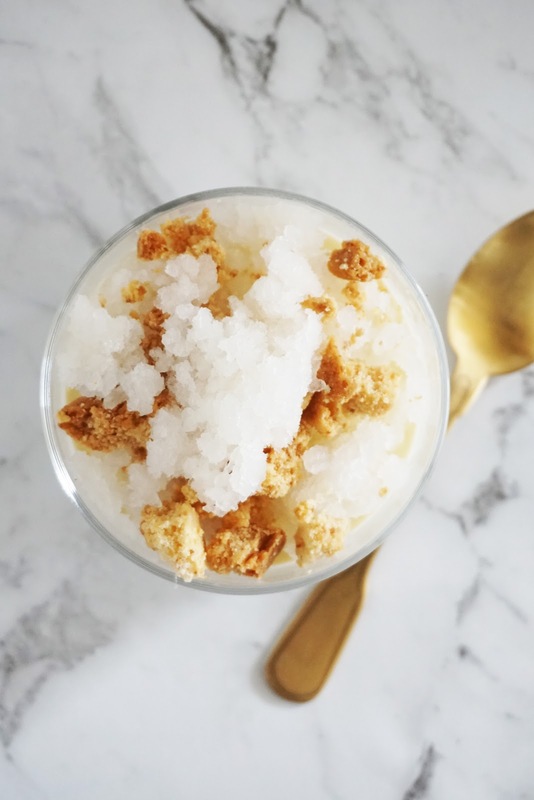 Check the granita every hour for 4-6 hours, scraping it with a fork from the outside edge to the middle, breaking them up until it reaches a snow-like consistency. Toast desiccated coconut on a small frying pan over low heat, stirring constantly, until golden brown. Set aside to cool completely. Using an electric mixer, beat butter and sugar until pale and fluffy. Add vanilla extract and salt, beat until combine. Using a spatula, fold flour into the butter mixture until just combine. Fold in the toasted desiccated coconut until combine. Place a piece of cling film on a flat surface. Place dough on the cling film and shape it to form a sausage about 4cm in diameter along the width of the cling film. Roll the cling film over the dough, twist both ends of the film. Refrigerate for an hour or until firm. Preheat oven at 140 degrees celcius fan-forced. Line a baking tray with baking paper. Unwrap dough and cut into 1cm thick discs. Place on the lined baking tray, leaving about 2.5cm gap between discs as they will spread out while baking. Baked for 20 minutes or until golden brown. The coconut shortbread store well in an air-tight container for a week. Scoop a few tablespoons of granita on top of panna cotta. Roughly crush the coconut shortbread and sprinkle on top of the granita. Pineapple tarts are very popular in Singapore during Chinese New Year. They are moreish bitesize cookies with pineapple jam on top. They symbolise prosperity to come and are serve to visitors during Chinese New Year. Pineapple tarts are my favourite. I like my pineapple jam spiced with cinnamon, cloves and anise. And a buttery shortbread that snaps and crumbles, with that special sandy texture of a shortbread, and a hit of salt at the end. 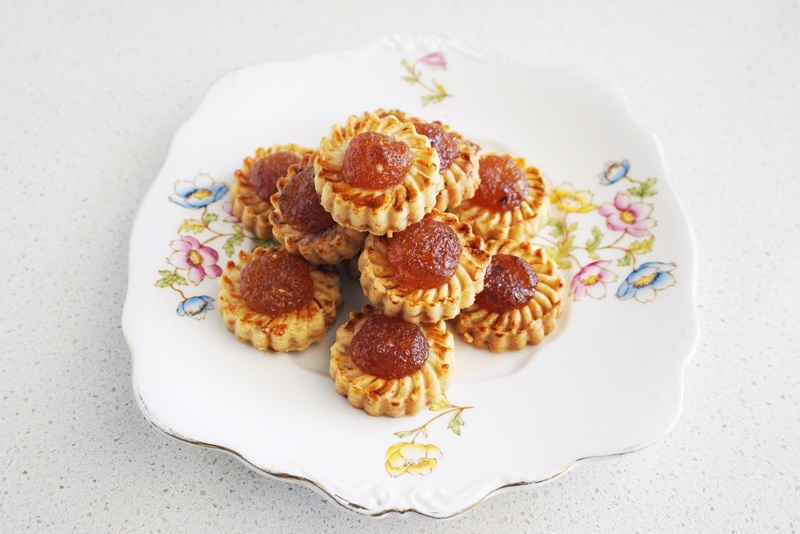 Macadamia is not traditional in pineapple tart, but I like the subtle roasted nutty flavour in my pineapple tarts. The macadamia is my secret touch. Well, I guess, it’s not so secret now. I use the traditional pineapple tart cookie cutter mould to get the patterns on the cookies. I brought the cookie cutter mould in Singapore many years ago. You can get it online easily these days. You don’t need the special cookie cutter mould though. I tried it with a standard flute cookie cutter, and before you lift the cutter, and with the cookie still in the cutter, make an indentation to hold the jam with a dowel, a rod or even your finger. You won’t get the pretty pattern on the cookie, but it will still look pretty good. Oh, just so that you know, if you try to make the indentation after you remove the cutter, the cookie will most likely crack and break. I use canned pineapple slices in natural juice. Probably not a traditional thing to do. But I promise you that it will be the same as fresh pineapple and you won't be able to tell the difference. Pineapple jam is best make a day before assembling. Drain pineapple slices and discard juice. In a food processor, Pulse pineapple slices to get an even finely grated pulpy texture. This should require only 3 to 5 short one second pulse. The aim is not to get a puree, but a pulp texture. In a small saucepan, combine pineapple, juice from processing the pineapple, and the remaining ingredients. Place over medium heat and bring to a boil. Reduce heat to gentle simmer, give a quick stir occasionally (every 15 minutes), and when all the liquid has almost evaporated, stir more often (every 5 minutes) so that the jam does not burn. The jam is ready when all the liquid has evaporated. The whole process should take about 1 hour. The jam should be fairly dry but still moist, and golden brown in colour. Transfer jam to a shallow dish or pyrex container, spread jam out evenly, remove the cinnamon stick, cloves and anise star, cover and refrigerate until completely cool. Jam can be stored for a week before use. You will also need 1 egg yolk for egg wash. Optional. Roast macadamias in a preheated oven at 160 degrees celcius fan-forced for 10-15 minutes, or until golden brown. Remember to stir the macadamias once or twice while roasting to ensure all the macadamias are evenly roasted. Allow macadamias to cool completely. Transfer the macadamia and flour mixture to a large bowl. Add the remaining plain flour, rice flour and salt to the mixture. Stir to combine and set aside. Using an electric stand mixer with paddle attachment, beat butter, sugar and vanilla extract until light and fluffy. Stop mixer. Add the macadamia and flour mixture. Using a spatula, mix all the ingredients until just combined. Gather mixture into a ball and wrap in clip film, pat down into a disk, and refrigerate for at least 2 hours or until firm. Preheat oven at 160 degrees celcius fan-forced. Roll a teaspoon of the pineapple jam into a ball, and place jam on the cookie, press jam lightly onto the cookie. If you are using egg wash, brush beaten egg yolk lightly over the cookie and jam. The egg wash is make the cookie and jam glossy and darker in colour. Bake for 20 minutes. Allow to cool on baking sheet for 5 minutes before removing to a wire rack to cool completely. Store in air-tight container. I think these egg tarts are suffering from an identity crisis. You see, these are inspired by the Hong Kong style dim sum egg tarts. The pastry is a Chinese style puff pastry, not unlike the French version in terms of technique, but the pastry is slightly easier to manage and more forgiving. Yet we use butter here, like the French, instead of shortening or lard typical in the Chinese style pastry. The egg custard filling is a Japanese custard pudding, also known as purlin. I shared the recipe here once before. 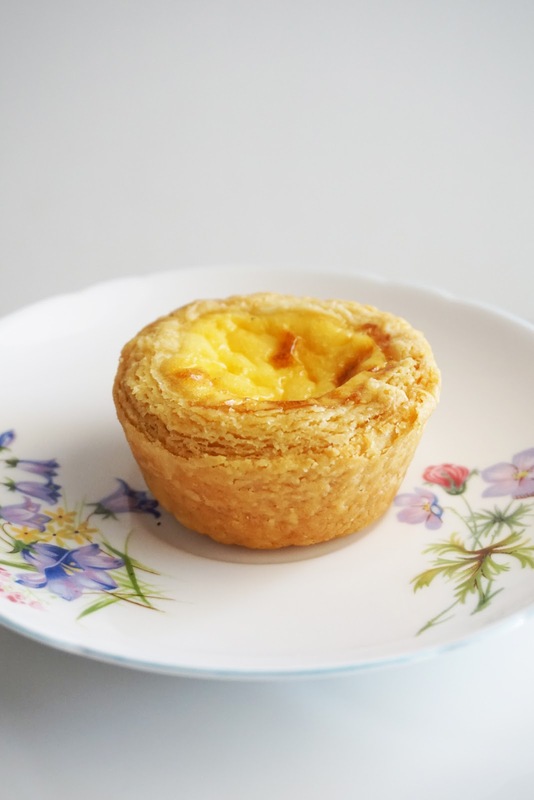 And these egg tarts look just like the Portuguese custard egg tarts, baked in muffin tins and to golden perfection. So is it Chinese, French, Japanese or Portuguese? Are you as confused as these egg tarts. No matter. 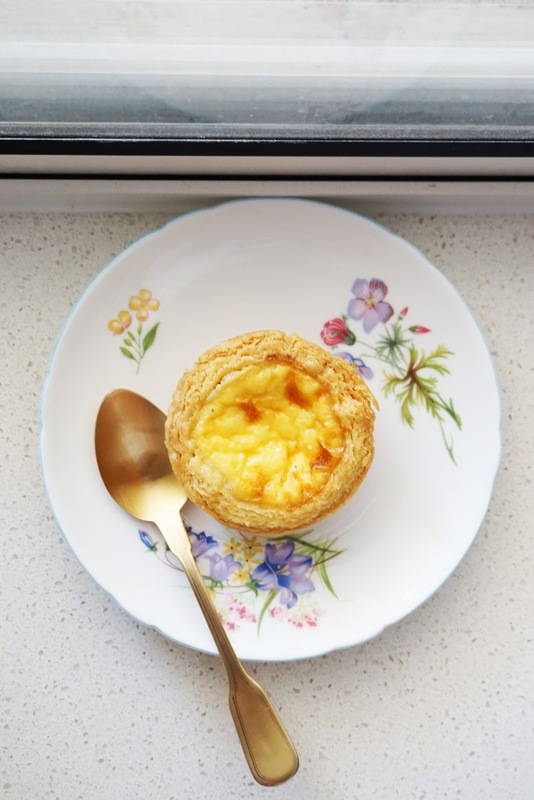 It has everything I seek in an ultimate egg tart. The pastry that shatters into crispy flaky buttery shards. 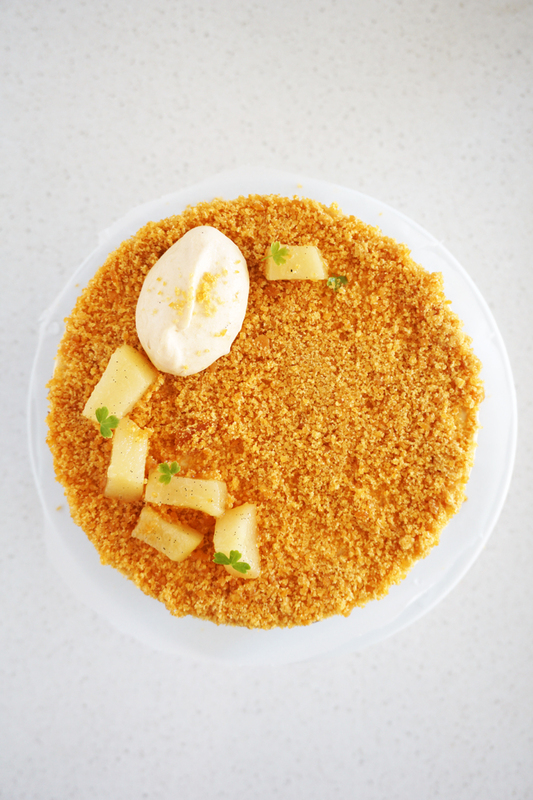 The creamy vanilla egg custard with caramelise patches of Instagram drool worthy perfection. And the perfect egg to pastry ratio. 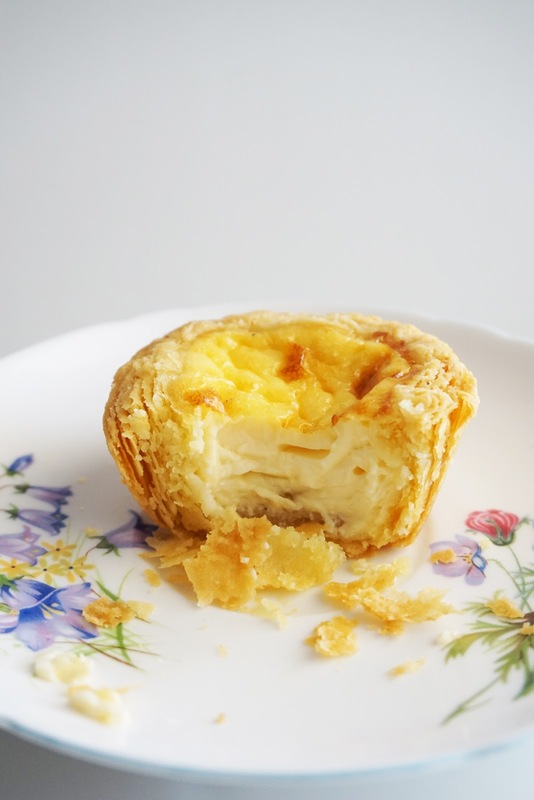 If you are looking for the recipe to the ultimate flaky egg tarts, look no further, try this. I even add the (almost) step by step photos to give you courage to make these. And for reference, I give you the link to the flaky pastry post from Dreamers Loft where the pastry recipe originates. You are welcome. Place butter and plain flour in a food processor and pulse until the mixture resembles fine crumbs. Pour mixture on a cling film, working quickly with your hands, gently squash/press the mixture together to form a dough, wrap dough with cling film, and quickly shape dough to roughly 10cm x 12cm rectangle. Refrigerate for at least 30 minutes. On a hot day, you might need to refrigerate the dough for longer until dough is firm. On a flour-dusted surface, with a rolling pin, roll the water dough slightly three times larger than the fat dough, about 30cm x 16cm rectangle. Place the fat dough in the centre on top of the water dough. Fold over the water dough to wrap and enclose the fat dough. Press all seams to seal. With a rolling pin, gently and evenly roll out the parcel into a 30cm x 20cm rectangle. Lightly dust with flour as required to ensure the pastry does not stick to the rolling pin or the work surface. And then one third over it. Note that you will get 3 layers. Wrap pastry in cling film, refrigerate for at least 30 minutes and until firm. Repeat the above folding one more time - Roll out pastry into 30cm long and 20cm wide. Don't forget to lightly dust with flour as required. Repeat one third fold left and one third over it as above. Wrap pastry in cling film, refrigerate for at least 30 minutes and until firm. Now the final turn. Roll out pastry into 34cm long and 20cm wide. Fold one quarter left to centre of pastry, and the other quarter right. Fold pastry in half like a book. Note that you will get 4 layers for this last turn. Wrap pastry in cling film, refrigerate for at least 30 minutes or until firm. Roll out pastry into roughly 1/4 inch thick and 30cm x 30cm, big enough for 6 nos 10cm circles to line the muffin tins. Cut out circles with cookie cutter and line the pastry in the muffin tins. Refrigerate until ready to use. Place milk, vanilla seeds and pod in a saucepan over medium heat. Cook, stirring, for 6 to 8 minutes or until it just comes to the boil (small bubbles will form at edge of pan). Remove from heat. Remove vanilla pod. Place the egg, egg yolks and sugar in a bowl and whisk until well combined. Gradually add the hot milk mixture, whisking to combine. Strain the mixture through a fine sieve into a pouring jug. Refrigerate and allow to cool completely. Preheat oven to 180 degree celcius fan-forced. Pour cooled filling in prepared pastry cases. And baked for 30 minutes or until pastry is golden and caramelise patches appear on the custard. Serve while still warm. 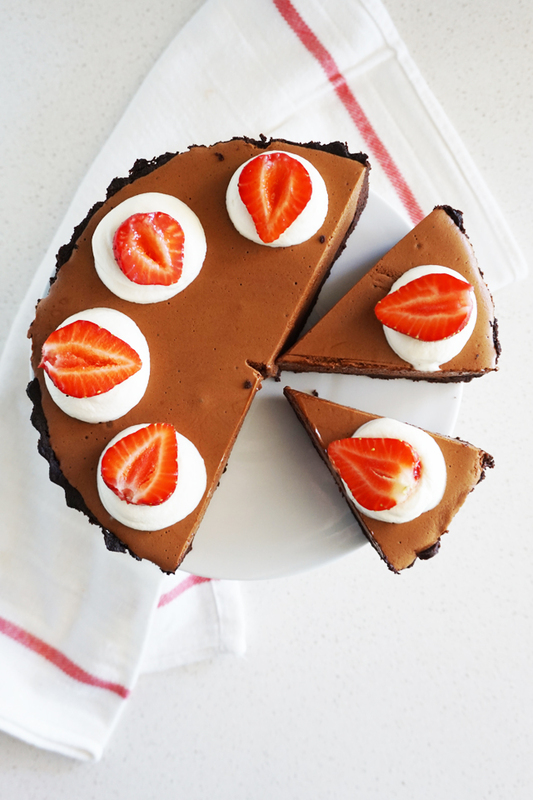 The chocolate filling for this tart is so light, airy and delicate that it disappears in my mouth like a puff of air! I could accidentally inhale the whole thing. 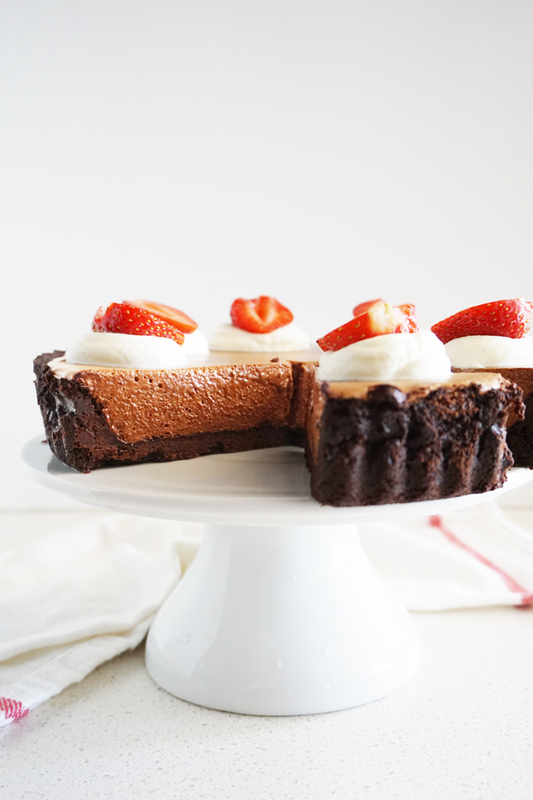 I was never a huge fan of chocolate tarts, but this chocolate tart simply blows my mind! I followed the original recipe with just a couple of minor modifications. I added a pinch of salt to the pastry because I like a little salt in my chocolate. I also changed the technique for making the pastry slightly. The original recipe suggests to "push (the pastry mixture) into the tin with fingers and knuckles, just as one does for the crumb crust of a cheesecake". This didn't work for me because I couldn't seems to get a thin even layer. So instead, I rolled out the pastry and lined the pastry into the tin. The pastry is a little crumbly, so it broke up in a few places, which is fine as it can be easily patched up by pressing the broken up pieces back. Also I freeze the pastry overnight before baking as it really helps with reducing shrinkage. And I pricked the base all over with a fork just so that the pastry doesn't puff up when it bakes. A few tips making this pastry. First, butter the tin even if it's non-stick. This pastry will stick to the tin as I learned the hard way. Second, don't bother with blind-baking because the pastry will stick to the baking paper. Again, I learned this the hard way. Lastly, don't remove the pastry from the tin until the filling is set. This pastry is quite delicate and crumbly, and the filling helps to hold the pastry together. I have altered the recipe to the way I made the tart, but feel free to refer to the original recipe. Optional: You will also need unsweetened whipped cream and strawberries to serve. Butter a 23 cm tart tin lightly. Using an electric mixer with paddle attachment, cream the butter and caster sugar until very pale. Stop the motor. Combine flour, cocoa powder and salt in a separate bowl, then sift the flour mixture into the butter mixture. Using a spatula, incorporate the flour mixture into the butter mixture until well combined and starts to form into a dough. Wrap pastry with plastic wrap, flatten into a disc, and refrigerate for 30 minutes. Roll out the pastry between two sheets of baking paper until 1/4 inch thick. If the pastry becomes too soft and difficult to handle, put pastry in freezer for 5 minutes until firm but pliable. Lift pastry into tin, ease into base and side. Trim off any excess pastry. Prick the base all over with a fork. Freeze the pastry overnight. When ready to bake the pastry, preheat oven to 180 degree celcius fan-forced. Bake the pastry (from frozen) for 20 minutes. Let cool completely in tin. Soak the gelatine leaves in a bowl of cold water. Meanwhile, combine the chocolate and coffee in a heatproof bowl that fits snugly over a saucepan of simmering water, making sure the base of the bowl does not touch the water, then stir from time to time until the chocolate has melted and the mixture is smooth. Remove the bowl from the pan and set aside, then tip out almost all of the hot water, leaving just 2 tablespoons in the pan. Squeeze the gelatine leaves and drop them into the water left in the pan, then stir to dissolve. Pour into the chocolate mixture and stir well. Using an electric mixer or hand-held electric beaters, beat the egg yolks, half of the caster sugar and the vanilla until thick and pale. Fold the egg yolk mixture in the chocolate mixture, ensuring that it is all well mixed together. Refrigerate to chill for 15 minutes, whisking once or twice, until the mixture reaches room temperature. Wash the bowl and beaters and dry very thoroughly. Using the electric mixer, beat the egg whites until soft peaks form. Gradually beat in the remaining sugar until you have a glossy meringue. Fold into the chocolate mixture and pour into the chocolate pastry case. Refrigerate to set for at least 4 hours. Carefully remove tart from tin, and decorate with the whipping cream and strawberries to serve if desired. New year. New resolution. I need to update this space less sporadically. Can't believe that I only posted once last year! Weekly update is too much of a project for me. Monthly post seems doable, perhaps, maybe. I'm never good at keeping resolutions. I plan to share more savory recipes and explore some healthier sweets and cakes this year. So stay tune, people, or whoever patient enough to still check this space even after my singular post last year. For that, I thank you. Let's kick start the year with this rather understated, almost boring, but amazingly flavorsome and refreshing dessert. Poached fruit was never my thing. Not something I would order in a restaurant or thought worth the effort to make at home. That was, until recently, I had poached pear for the first time. It was in a restaurant opened only a few months ago. We heard great reviews and thought we should check it out. We had their nine course meal special which did not come with dessert. It is strange, I thought, that a multi-course tasting menu does not include a dessert. The food was delicious but we were desperate for something sweet. We were told that there was no dessert menu. Only poached pears if we want it. Disappointed and almost reluctantly, we said yes to the poached pear. 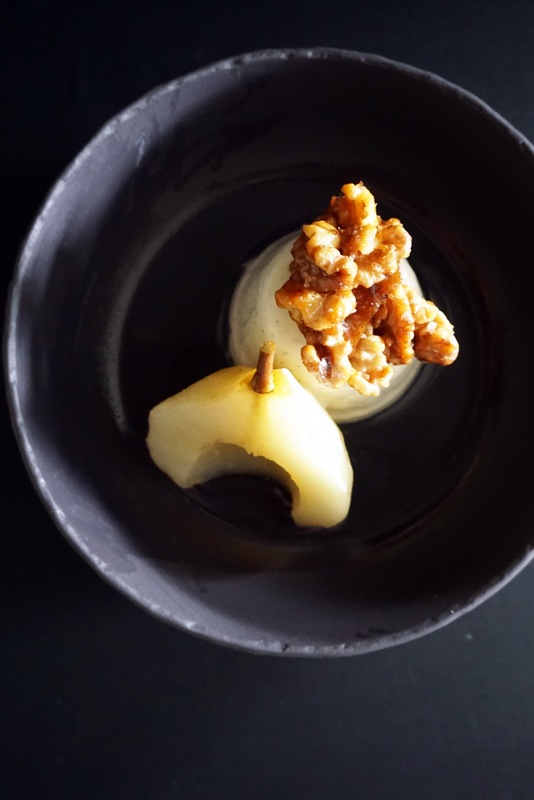 The restaurant serves the poached pear with a spoonful of greek yogurt, a broken up walnut biscuit, complete with drizzle of poached pear syrup. I'm not going to lie, it sounds as unimpressive as it looks. But the moment I had my first taste of the poached pear, all is forgiven. The pear perfectly poached, infused with the subtle hint of spices, still firm but soft enough to eat with a fork, sweet but not overly so. The greek yogurt adds creaminess and tartness. The walnut biscuit adds the crunch element that this dessert needs. And not forgetting the poached pear syrup that ties everything together. This is my glam up version of the dessert. Yogurt panna cotta instead of just plain old yogurt. Candied walnut slightly salted with a sprinkle of sea salt instead of boring walnut biscuit. This is now one of my top favourite desserts. 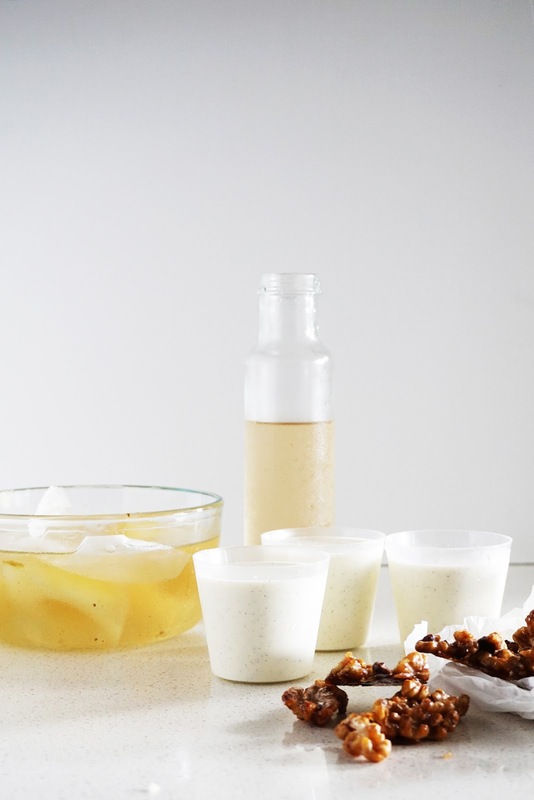 The sweet spiced poached pear, the wobbly creamy yogurt panna cotta, the additive sweet and salty candied walnuts. The perfect summer dessert. I'm happy to eat this for breakfast too. Each element can be make days in advance. Tips to store them in recipe below. Make cartouche by cutting a round piece of baking paper with diameter slightly bigger than the saucepan that you are using. This will be used during poaching to cover the surface of the poaching syrup and ensure all the pears stay completely submerged. Peel pears, and use a melon scoop to remove the core of the pears from the base. Choose a saucepan that will accommodate all the pears. Combine caster sugar, water, cinnamon and nutmeg in the pan and bring to the boil, stirring to dissolve the sugar. Reduce the heat to a simmer. Add the pears to the simmering poaching syrup and cover the surface of the syrup with the cartouche. Place a plate on top to ensure the pears stay submerged. Gently poach for about 15 minutes or until you can easily pierce the flesh with the tip of the knife. Remove from heat and allow the pears to cool completely in the syrup, covered with the cartouche. 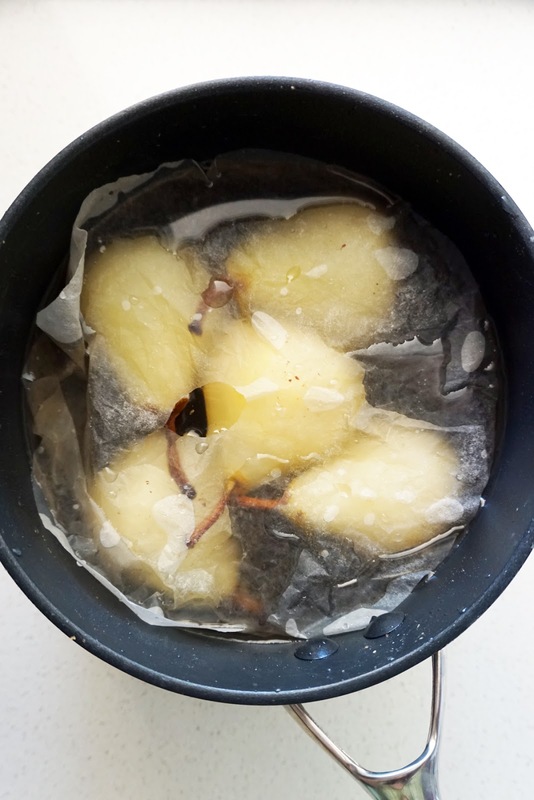 Transfer the pears to a storing container, make sure they are completely submerged in the syrup, covered with the cartouche, and close lid of the storing container. Refrigerate until needed. The pears will keep in the fridge for up to 1 week and best served cold. Reserve a cup of the poaching syrup, return the syrup to saucepan, boil for 10 minutes or until syrup is reduced by half. Once cool, store syrup in a jar until needed. - This is best make at least a day before serving to allow the spice to completely infused. - Choose pears that is in between hard and ripe. Ripe pear will become too mushy when poached. While hard pear will stay hard. 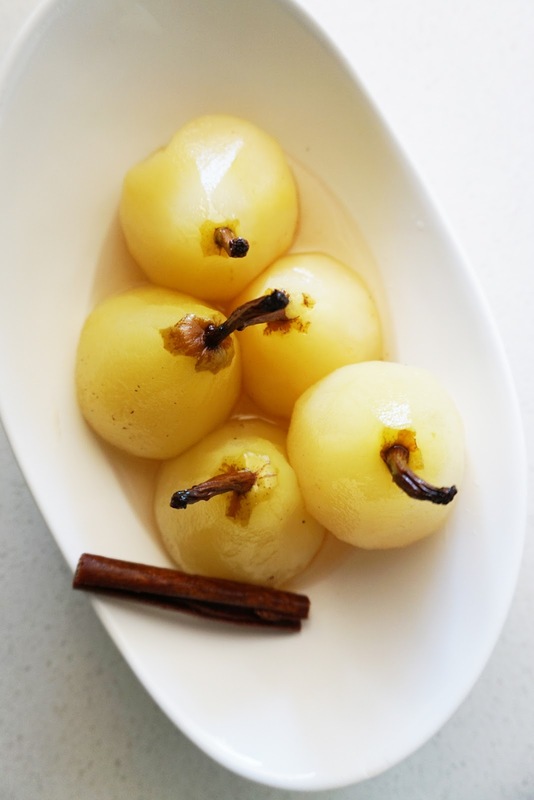 - To prevent pears from browning, squeeze lemon juice over each pear or soak pears in slightly salted water. Soak gelatine sheets in cold water until softened. Meanwhile, combine cream, milk, sugar, vanilla bean and seeds in a small saucepan. Stir over medium heat, and when mixture just starts to simmer, remove from heat. Squeeze the excess water from the gelatin and stir the gelatine into the warm mixture until dissolves. Add yoghurt to the mixture and stir until well combine. Strain mixture into dariole moulds. Refrigerate for 4 hours or preferably overnight. The panna cotta will keep in the fridge for up to 1 week. To turn out the panna cottas, dip each mould into very hot water and give it a little shake. Turn the mould upside down onto a plate and shake gently to dislodge. Place walnuts, caster sugar and butter in a non-stick fry pan over medium heat, stirring frequently until the sugar mixture starts to melt and coat all the nuts. Once the sugar mixture starts to caramerlise and the nuts start to take on a deep golden colour, transfer immediately onto a baking paper and quickly separate all the nuts with a spoon or spatula. It will be scorching hot so don't be tempted to touch the nuts with your bare hands. Sprinkle nuts with generous pinch of sea salt. Allow to cool completely before storing in an air tight container. Do not refrigerate! 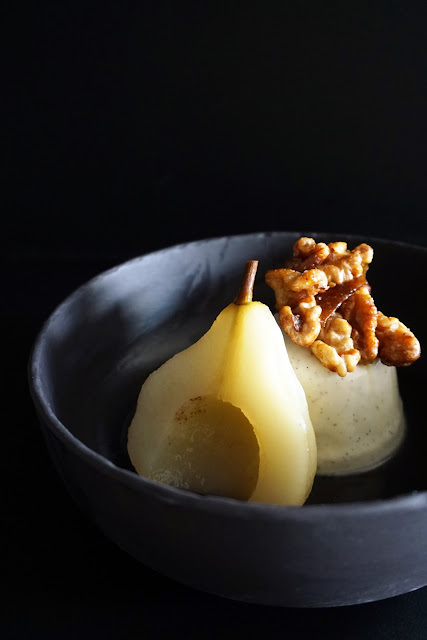 Place panna cotta on the centre of a bowl, place half a pear on the side, drizzle with the reduced poaching syrup and top with a couple of candied walnuts. Enjoy.